You might think of the federal government as your protector against abusive debt collection practices and robocalls to your cellphone. But if a provision in the federal budget bill now before Congress becomes law, robocalls to cellphones would be fair game for anyone collecting a debt guaranteed by the federal government. That, say consumer advocates, could open the floodgates for calls to student loan borrowers, mortgage borrowers, taxpayers, and others with debt backed by the federal government. Calls could also be made to borrowers' relatives, their references, and anyone unlucky enough to have a reassigned cell phone number on a collector's list. 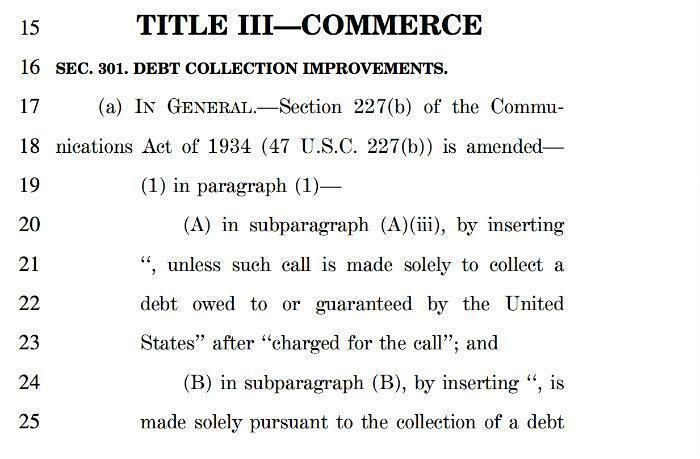 Section 301 of the budget bill removes the current requirement for a caller to have the consent of the called party before making autodialed or prerecorded calls or texts for the collection of debts owed or guaranteed by the federal government. It also removes the ability of the called party to stop these unwanted robocalls to their cellphones. The Federal Communications Commission received more than 215,000 complaints related to unwanted calls in 2014. As a result, the Commission adopted stronger regulations to better protect consumers from unwanted robocalls and texts this past June. "The Fair Debt Collection Practices Act badly needs updating but for the purposes of protecting consumers from widespread harassment and debt collector abuses, not for facilitating those abuses," Saunders noted, "and we hope that the Consumer Financial Protection Bureau, which is considering stronger rules, will move to rein in these type of abuses."